According to Pattern Energy, 50 Siemens 2.3 MW wind turbines power the El Arrayan wind farm, which completed construction in June. 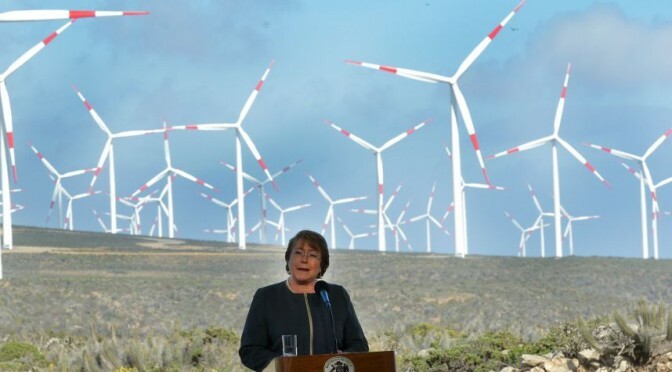 The President of Chile, Michelle Bachelet, together with Jean-Paul Luksic, Chairman of Antofagasta Minerals SA (“AMSA”) and Mike Garland, CEO of Pattern Energy Group Inc. (NASDAQ: PEGI) (TSX: PEG) (“Pattern Energy”), officially opened operations at the 115 MW El Arrayán Wind facility in a Grand Opening ceremony held on Tuesday at the project site, which is located 400 km north of Santiago on the coast of Chile. “Through this partnership, we have combined our financial and management skills to be part of the solution to one of the major challenges facing our country and the mining industry, which is the generation of clean energy sources,” said Jean-Paul Luksic, Chairman of Antofagasta Minerals SA. Pattern Energy owns 70% of the El Arrayán Wind facility, which it also operates. AMSA owns the remaining 30% minority stake. The project sells approximately 70% of its output to Minera Los Pelambres through a long-term fixed-for-floating hedge. The facility sells its remaining output into the Chilean spot market at the prevailing market price at the time of sale. In addition to its minority interest in the facility, AMSA is the controlling party of Minera Los Pelambres. El Arrayán Wind connects to the Sistema Interconectado Central’s 220kV transmission system. The facility is located on approximately 15,320 acres of coastal land on a long-term lease with a single landowner. Approximately 200 jobs were created during construction, as well as up to 15 ongoing permanent positions. The project was constructed by Skanska Chile SA, a subsidiary of Skanska AB and one of the leading wind-focused construction firms in Chile. Compared to generation from a coal-fired power plant, the electricity produced annually by El Arrayán Wind will offset more than 300,000 metric tons of carbon dioxide, the equivalent to the annual carbon footprint of an estimated 70,000 Chileans, and will conserve enough water to meet the needs of more than 11,000 Chileans, according to statistics from the International Energy Agency, the World Bank and the U.S. Energy Information Administration. Pattern Energy Group Inc. (Pattern Energy) is an independent power company listed on the NASDAQ (“PEGI”) and Toronto Stock Exchange (“PEG”). Pattern Energy has a portfolio of eleven wind power projects, including one project it has agreed to acquire, with a total owned interest of 1,472 MW, in the United States, Canada and Chile that use proven, best-in-class technology. Pattern Energy’s wind power projects generate stable long-term cash flows in attractive markets and provide a solid foundation for the continued growth of the business.